As the winter season has just arrived, it’s getting a little more than just chilly. This gives you another reason to change your wardrobe and avail the amazing winter sales going on at Royal Tag, Urban Culture, and other brands. Royal Tag offers a huge variety of formal and casual wear for men, which includes blazers, sweaters, kurtas, suits, shirts, trouser and other accessories. It is giving up to 50% off on all its products and with its easy to return policy and delivery option; you can’t say no! Visit their outlet or website to this discount. Uni Worth is another renowned brand in Pakistan for men’s formal and casual apparel. It is giving up to 50% off on everything. However, the discount varies product to product. Take a look at their extensive variety of clothes and accessories at good prices. Don’t forget their budget deals too. Urban Culture is giving a flat 50% discount on all its clothes, footwear and accessories for men as well as women. It offers all the latest fashion in western wear with guaranteed high quality. Get the deal before all the items go out of stock! Urban Culture also delivers nationwide for FREE. 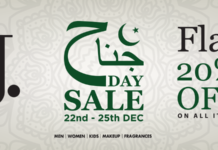 Firdous is offering a discount of up to 50% on all its items. It mainly deals in eastern wear for women as well as men. However, it has recently announced it will also offer a small range of suits, sweaters, and blazers for men. The latest Pashmina collection and silk tunics by Firdous are one of its kinds in Pakistan. Firdous will soon offer delivery services too, but until then, enjoy its winter sale. Make sure you visit their outlets or just order online. Don’t miss out on these once in a year sales!